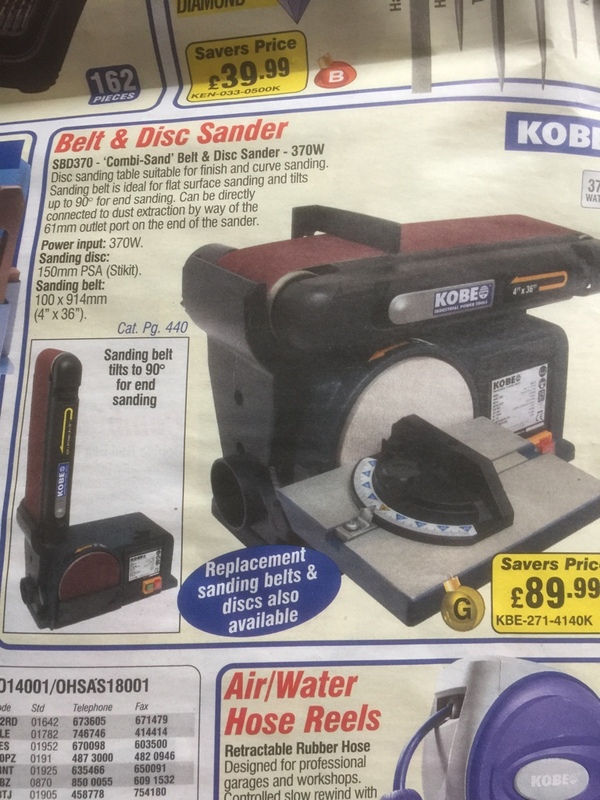 Went to Cromwell tools yesterday for some bits and noticed this in the offers paper while I was in there. Listed at £89.99 in the paper. They had no stock in the Nottingham branch so I decided to order on line where I found it at £74.99. Placed the order and it arrived today. Looks a decent bit of kit to be fair considering the price. I'll let you know how it performs. I had a similar one (a Skil) and wore it out. I found that the belt was handier than the disk sander portion but that was just my use. Used it almost exclusively for wood. I made a simple jig and used it for tapering the back end of wooden arrow shafts (to 5/16 in from 11/32 or 23/64). I've since obtained a larger version (10 in. disk and 6x48 in. belt). I use it regularly - again mainly for wood although with care it can be used for metal (sparks in my dust collector are not to be considered ). You should find it very useful. Hoping so. Mine will most likely be used for metal I think. Been after one for a while. It looks identical to the one I got from Machine Mart. works OK but the belts are a bit naff, the scarf joints are horrible and bumpy. I need to look for another belt supplier. I don't know about yours but on mine the disc is stuck on so when it wears out you have a gluey mess to get off the plate which is a bit of a pain. apart from that it does what I want. Replace your glue with a Velcro pad and buy "other half of Velcro" sanding discs. Try Abtec for good quality belts and discs. No connection, just good suppliers. Seems there are a lot of different stickers that get stuck on this machine. I wrote a short piece on the one I purchased used, which I found to have considerable wobble when I got it. I still have it and it continues to work great after my little fix. As Sparky said, it definitely does seem to get re-badged a lot. Looks identical to the one I bought from Aldi here in OZ with the exception of the belt size being on a transfer and easy to see. Plus the Aldi one has the Velcro disk. It works well and does what I need plus it does not take up too much workshop real estate. Yes I realised that it was stick on (shame as I have a few Velcro discs the right size. Belt is ok. Joint is flat. Not sure how long it will last but at least its replaceable. Very quiet in operation which surprised me. I imagine that they all come from the same Chinese factory and just have a different badge on them. Replacement backing disks are available, I couldn't find 150mm ones, but larger ones can be cut down. Another alternative is to buy the velcro and cut out your disks. There is an advantage to the glued disks, in that they run more true than the velcro ones. +1 for Wheel tapper's comments.... I have the same from MM, my observations precisely, the main annoyance to me is the bumpy scarf joint. need to have a look at the platen under the belt as the sheet metal plate is not 'flat'. There are other methods of replacing / modifying the platen all over the place but, as said, it does what I want it to. My platen seems flat enough, it's just the crappy belts. I got 3 packs, fine, medium and coarse, the fine ones are perfect, the medium and coarse don't look like they were scarfed at all, just overlaid and glued. what I do need to make is a decent table for the long belt instead of the silly bit of angle iron, I can swop with the table on the disc but that's a load of faffing about. "15 micron glass fibre reinforced sticky tape" or the like?